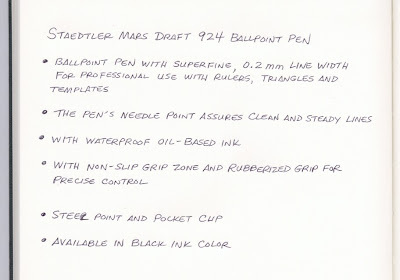 According to the STAEDTLER website the purpose of the STAEDTLER Mars Draft 924 Technical Ballpoint Pen is for “professional use with rulers, triangles and templates.” However, you don’t need to be an engineer or draftsman to appreciate this pen. The super-fine 0.2mm needle tip is much smaller than what you would normally find on most pens available in the USA. I wasn’t surprised to discover that the super-fine tip ink refills for this pen are made in Japan where good quality fine tip pens can readily be found. The waterproof oil-based ink is available in black only and the refills come in packs of two. Since the needle tip on the STAEDTLER 924 is so fine I wondered if the ink flow could keep up with rapid note taking and I found that it didn’t skip a beat while I took notes. After four months of use I have not had any trouble with dry-starts or ink skipping, but it does occasionally leave little ink blobs behind as is typical of most ballpoint pens. The light-weight body is slender and is made from a grey plastic that is somewhat metallic looking. The grip is non-slip and made with a comfortable grooved grey rubber. It has a stainless steel pocket clip and tip. This pen is retractable and is about 5 5/8” long with the tip extended. If you like large or heavy pens this pen probably isn’t for you. My hands are rather small so I find that it’s quite comfortable to write with. 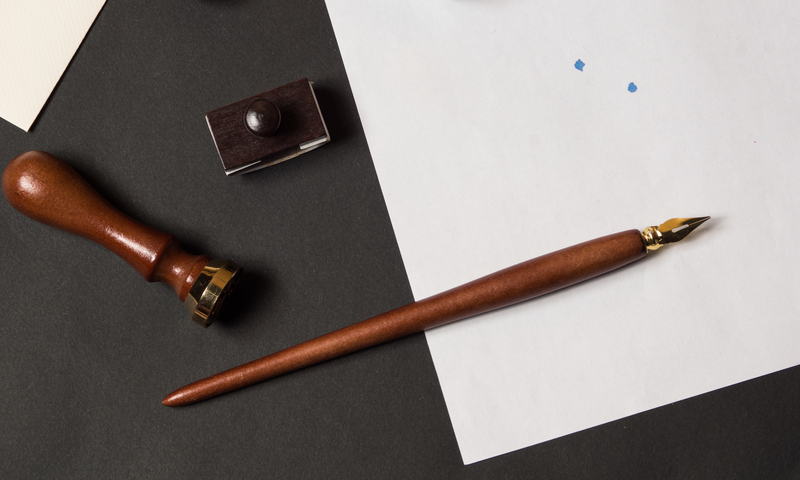 What’s your favorite super-fine tip pen?